The kitchen is one of the most important rooms in any house. Always the hub of activity and entertaining. This room in particular, should be as functional as possible while still showing off your personal style. We can help you sort through the many options so that your final kitchen will meet your needs, budget and taste. Specializing in large-scale Tampa kitchen remodeling, we pride ourselves on our quality reputation. Our professional kitchen remodelers will complete all work for your project with careful attention to detail, craftsmanship and budget, from start to finish. You can rely on our team to ensure that you have an outstanding remodeling experience. If you have put up too long with an outdated, unattractive, or inconvenient kitchen, it may be time to give us a call. Let us help you create the kitchen of your dreams! 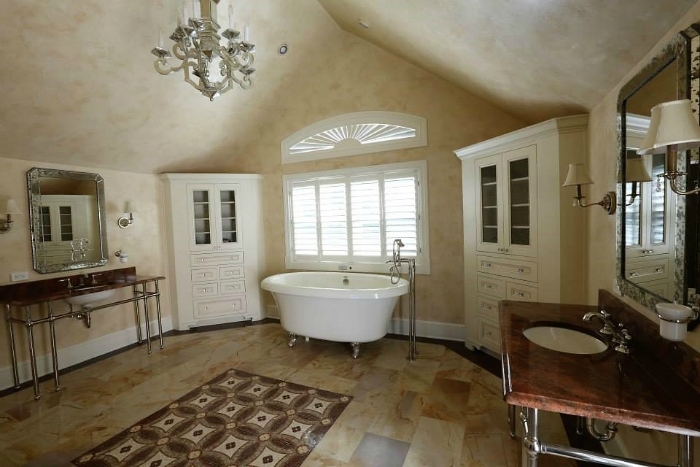 No home or office remodel is complete without a bathroom renovation. Bathrooms play a significant role in any dwelling space and can significantly affect your quality of life. Whether it is a beautiful new walk-in shower at home or a spacious, luxurious bathroom at work, Triad is here to make your dreams a reality. Your experience with the bathroom remodeler Tampa trusts will be one of ease, convenience and satisfaction. We work one-on-one with our customers to assure that each remodeling project goes smoothly, stays within budget and proceeds on schedule to exceed our client’s expectations. Whether you have specific ideas for your new bathroom or would like some help exploring the countless possibilities, we offer complimentary in-home consultations that give you the opportunity to ask us important project questions and get a professional estimate. We treat every project with utmost care and focus to ensure a satisfying remodeling experience for our clients. Our years of experience in remodeling give us the knowledge and resources required to make your dream become a reality.